U.S. Customs and Border Protection is making the move to 9mm Luger and issuing all-new Glock pistols to its personnel. Not only are they going with some of Glock’s latest and greatest, they’re going with one gun that’s been all rumor until now. 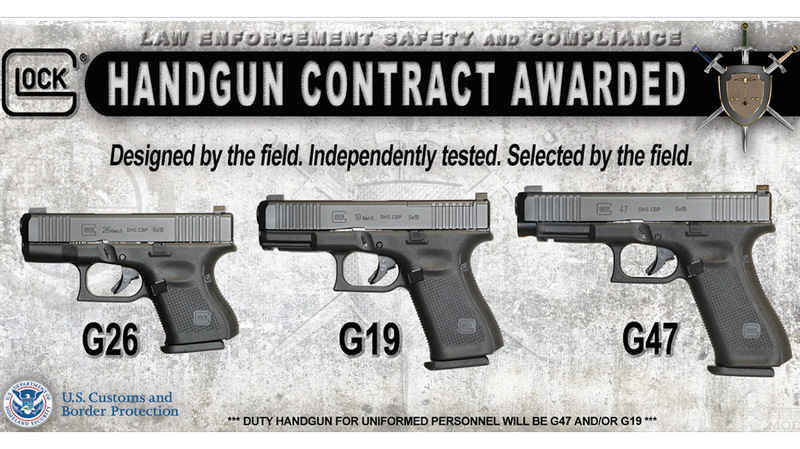 The agency will issue Gen 5 versions of the compact Glock 19 as well as the no-longer-secret full-size Glock 47 to officers as well as the subcompact Gen 5 Glock 26 pistols for plainclothes work. “The solicitation process included independent performance testing by the National Institute of Justice laboratories, direct input from over 16,000 CBP law enforcement personnel and extensive field evaluations,” said the CBP statement. Customs and Border Protection is one of the largest law enforcement agencies in the country and this is an equally large contract. The 10-year contract is worth up to $85 million and will transfer all its law enforcement personnel to 9mm by 2021. This is another example of a law enforcement agency moving away from .40 S&W to 9mm. When .40 S&W was introduced it offered better performance with expanding ammunition but today the differences between the two are less impressive. Also, 9mm often has less felt recoil and costs less. Both the Glock 19 and Glock 47 are MOS-type pistols with slides machined for optional mini red dot optics. All three have the full set of Gen 5 features including a straight pistol grip, improved grip texture and forward slide serrations. 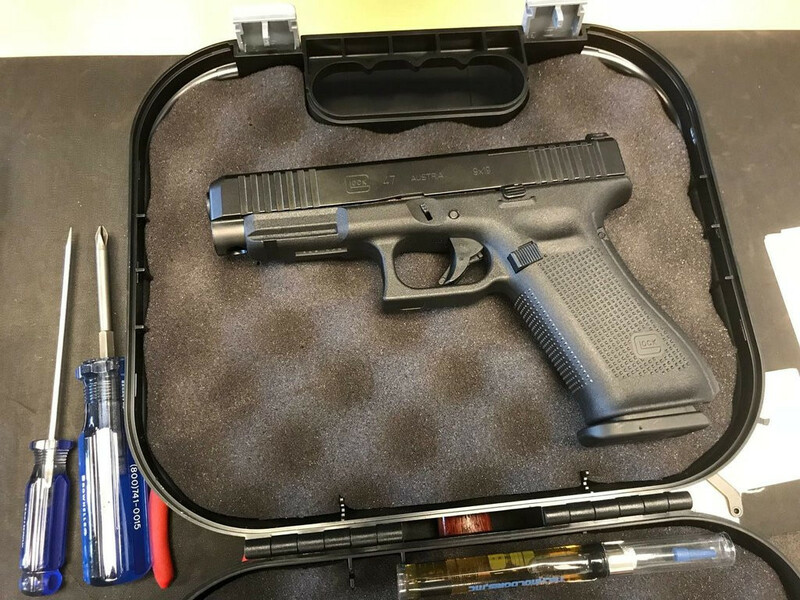 The new Glock 47 appears to be a Glock 45 with an extended barrel and slide. At first this seems odd since the Glock 45 is essentially a full-size Glock 17 frame modified to use a compact Glock 19 slide and barrel assembly. It looks like the main difference between the Glock 17 and Glock 47 is that while both start as full-size handguns, the Glock 47 may be able to accept Glock 19 upper assemblies, just like the Glock 45. If that’s true then the Glock 47 upper assembly may be compatible with the Glock 19 frames, adding another configuration to the mix. This would mean that departments that issue both Glock 19s and Glock 47s could have many different carry options, giving officers a little more flex in what they carry, when. That could also mean that armorers have the ability to mix and match more parts if necessary. While not as modular as some other designs on the market, it’s safe to say that Glock is doing well at staying competitive. This is a good deal for Glock and a solid update for the U.S. CBP. I was Border Patrol. After shooting HK and Glock, I would trust HK much more. If you want to change, maybe look at made in USA Smith and Wesson. I own a few of those and they shoot better. Fit your hand also. great combo ! The NYPD has been using the 19/26 for a long time with good results. I love my 26, very versatile, you can be an undercover with the 26, and carry high cap magazines for the 19/17/47 as back up reloads and be well armed. It shoots as well as the full size. I’m all for law enforcement having the best equipment but $85 million to replace weapons that there is nothing wrong with? If Glocks are all they are made out to be (20k rounds before major refit) then we shouldn’t have to replace these weapons in a lifetime. Government wasting our tax dollars. CBP transitioned from the Glock 17 to the HK P2000 in 40sw in 2008. CBP qualifies quarterly and expends about 200 rounds, plus or minus, each qualification period. Doing the math, that’s about 9k rounds on the oldest of the HK’s. I would think the .40 would shorten the life of a similar weapon in 9mm. You say 20k rounds is the life of the Glock, I think the G17 could have been used by CBP a lot longer but management opted to change to the .40 round not because the G17’s were nearing the end of their service life but they felt the .40 better fills the needs of the Department. I think it’s probably time for a change, and back to a Glock is a good choice. But you are right, the Government does waste a lot of money, maybe not so much if these HK’s are exchanged or auctioned to dealers that would recover maybe half of the 85 mil. I don’t think you would have to look very hard to find Government waste that doesn’t make nearly as much sense as this. It would be nice if the government would make the 40s available to the general public at a reasonable price. By reasonable, a price reflecting the used nature of the weapons and the rounds through the barrel. It seems so often the weapons being retired are sent out at inflated prices. Let’s start with MO where they are passing a law for every household to have a firearm.